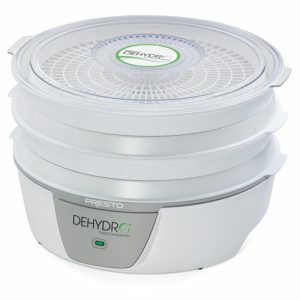 As everyone is not supposed to be familiar with dehydrators, we consider it necessary to say a few words about dehydrators before we start writing this dehydrator review on this Presto 06300 Dehydro Electric Food Dehydrator , your best dehydrator money can buy. A dehydrator, which is also called by some a food dryer or a fruit dehydrator, is an appliance ideally belonging to the kitchen. It dehydrates or dries fresh produces and meats using a combination of heat and airflow. This tool dries fresh vegetables, fruits, and meats by taking out the bacteria producing moisture from them while leaving the useful enzymes and nutrients. You can dehydrate fresh summer fruits and vegetables using a dehydrator at home and snack on them during the rest of the year. If you are a jerky lover, especially, beef jerky, a dehydrator can be very useful. Making treats for the pets using such machines is also a common phenomenon. Some people even make potpourri by dehydrating flower petals. As compared to supermarket prices, these homemade snacks cost a lot less and thus can save you a lot of money on snacking. Of course, you can purchase beef jerky and dehydrated fruits and vegetables from supermarkets and grocery stores. But this ready-made, easily available snacks pose a big threat to your own health and that of your children and other family members. Being commercially made, they inevitably contain a huge amount of chemicals and salt that are surely not good for your health. Consequently, they result in excessive bad cholesterol leading to strokes, heart diseases, and obesity among people who eat those snacks frequently. Toxicity found in these easy snacks is even reported to cause cancer, sometimes. Apart from having countless health benefits, dehydrating food is the greatest way to preserve food. Certainly, there are other preservation methods like canning and freezing. However, canning costs just twice as much dehydrating while freezing is seven times costlier. Dehydrated foods also require a one-tenth space of canned foods. So dehydration is also a less-expensive and more convenient method of preserving food, in terms of storage facilities and expenses. Now that a dehydrator is an important kitchen appliance for health-conscious and financially smart people, obviously, the next question will be how to choose one from numerous brands, models, types with varying performance etc. Especially, if you are a first-timer, the confusion is even bigger. Considering all these factors, we have decided to write this food dehydrator reviews on this presto food dehydrator, the best dehydrator possibly available on the market, in this range. This presto food dehydrator is able to function as a fruit dehydrator, meat dehydrator, and a beef jerky dehydrator, simultaneously. This food dehydrator possesses some features that are noticed only in more expensive brands and types of food dehydrators. This food dryer dehydrates vegetables, fruits, fruit rolls, herbs and spices, and jerky alike. Some people love to call it even fruit dehydrator. Let’s see some of the main features this best while cheap food dehydrator has to offer in bullet points. Expandability:Though it initially comes with 4 trays, its capacity can be expanded up to 8 trays by purchasing another 4 additional trays. Such flexibility in the capacity alongwith other features makes this appliance your best dehydrator. Space-saver:It doesn’t require a large space. A counter top should be enough to place it. User-friendly:It’s easy to operate. Even a novice won’t complain about the operation of it. Easy to clean and fully dishwasher safe. These are the features to be looked for only in the best food dehydrator. See-through cover:This excellent feature gives you the opportunity to monitor the dehydrating progress. You will be able to intervene in case anything goes wrong. Less sound pollution:The unit hardly makes any sound when in use. So you can use it unhesitatingly, even at night, without having to disturb your own sleep and that of your neighbor’s. With an affordable dehydrator with such good features and 792 food dehydrator reviews by Amazon customers and an average rating of 4.5, you cannot go wrong. We will surely recommend this Presto 06300 Dehydro Electric Food Dehydrator, your best dehydrator by most parameters, in particular, the best affordability.